Today, in a reasonably rare feat of unnecessary house-leaving, I decided to catch a movie before going to my seven o'clock art history lecture. The fourth (or third, depending on who you're talking to) installment of the Underworld series. Now, I am not a film critic, and for this I am thankful, as I can therefore enjoy dumb movies without feeling stupider for it. Underworld: Awakening was a good time, plain and simple. I didn't expect a whole lot from it aside from awesome werewolves and Kate Beckinsale in black latex and a corset. It certainly didn't disappoint! Sure, the story seemed stunted and unimaginative, although one twist they threw in really did leave me feeling mildly, and pleasantly surprised. It also didn't help that the ending was an obvious lead-in to a sequel, and ultimately made the story (which did contain a beginning, middle and end) feel halved and episodic. At the same time, though, it pleases me to think that there will likely be another Underworld film. Oh, and my art history lecture was pretty interesting, too. Da Vinci, Michelangelo and Raphael were the primary targets of today's class, and while they are interesting enough on their own, my professor (Brian Foss) definitely did a great job of adding to it. 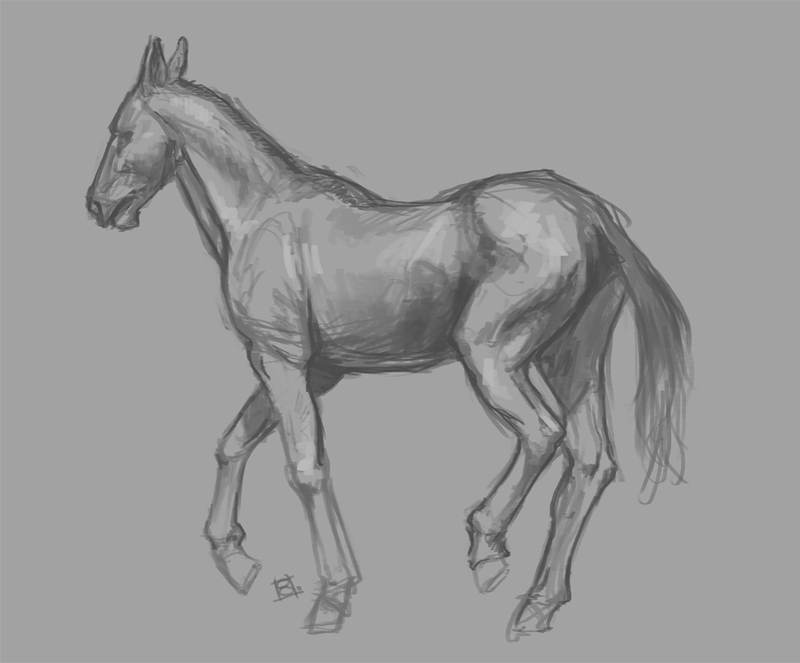 Anywho, I also did a quick horse-sketch/study while watching the ninth episode of Game of Thrones. As a rule, I am horrible at drawing horses - and I don't believe that has changed. 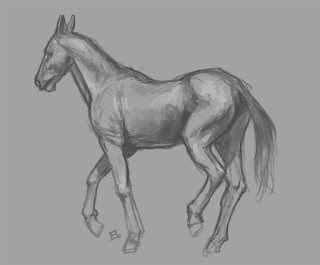 Tonight's sketch is exponentially better than my usual depiction of horses, but I think it might just be a matter of an improvement in the area of drawing from observation. Which is good too! Better, in fact.